This free, full-day workshop will explore the landmark Getty exhibition Cave Temples of Dunhuang: Buddhist Art on China's Silk Road and help 6-12 educators enhance their lessons. 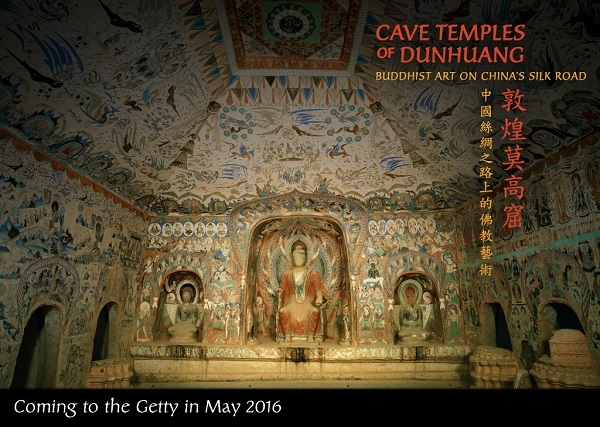 Featuring three full-scale replicas of richly ornamented Buddhist grottoes from Dunhuang, an immersive virtual reality installation, and rare Silk Roads-era artifacts and documents (including the Diamond Sutra, the world's oldest extant printed book), this exhibition will provide rich material for educators to share with their students. Workshop participants will learn about Buddhism, art conservation, and the unique history of Dunhuang from the Getty's curators, educators, and scientists. Teacher alumni of the Summer Institute on China (SIOC), an international professional development program for California middle and high school teachers, will share lesson plans that they created after visiting Dunhuang as well as help attendees generate their own classroom-ready material. Our current manuscripts exhibition focuses on narratives that have connected the peoples of Europe, Africa, and Asia. Explore the fascinating objects in the exhibition Traversing the Globe through Illuminated Manuscripts, on view at the Getty Center until June 26. Then, adapt the related lesson plan Telling Stories: Symbols of Life, designed to help secondary students develop visual symbols that represent narrative moments. Members of a school group looking at art while at the Getty Center. Open your students' eyes to art, history, and culture with a visit to the Getty Center or the Getty Villa. Visits and bus funding for 2016-2017 can be requested starting June 6, 2016 at 9:00 a.m.
Visit our K-12 Teachers and Students page for updates and more information. Admission to the Getty Villa is FREE. An advance, timed-entry ticket is required. Parking is $15, but $10 for evening events after 5:00 p.m.
Tues–Thu and Sun: 10 a.m.–5:30 p.m. Admission to the Getty Center is FREE. Parking is $15, but $10 after 5:00 p.m. for Saturday evening hours and for evening events.